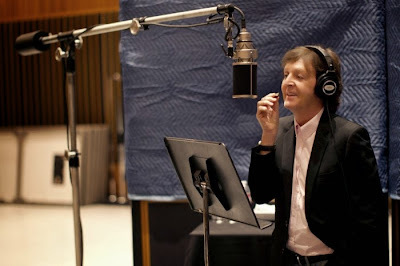 The new McCartney album, due out February 6th (7th in the USA), has leaked out to the internet in it's entirity today. And the title has been revealed (and twittered by Paul), "Kisses on the Bottom" - a lift from the lyrics of "I'm Gonna Sit Right Down And Write Myself A Letter". Amazon's editorial review: While many a musician is often asked about the tunes that have influenced their songwriting, it is not a question Paul McCartney ordinarily gets to answer - until now. Paul is about to offer a glimpse into "the songs which inspired the songs" with the upcoming release of a brand new album of those standards he grew up listening to in his childhood-plus two brand new McCartney compositions. With the help of Grammyr Award-winning producer Tommy LiPuma and Diana Krall and her band-as well as guest appearances from Eric Clapton and Stevie Wonder, McCartney's new album is a deeply personal journey through classic American compositions that, in some cases, a young Paul first heard his father perform on piano at home. As authentic and daring a musical statement as he could make, this is the album Paul has been thinking about making for more than 20 years - and probably the last thing his fans are expecting. "In the end it was 'Look, if I don't do it now, I'll never do it'," he says. In short, Paul believes it is about time "the songs me and John based quite a few of our things on" received the recognition they deserve. Moreover, the record also features a couple of new original McCartney compositions in the spirit of those classics. "When I kind of got into songwriting, I realized how well structured these songs were and I think I took a lot of my lessons from them," Paul explains. "I always thought artists like Fred Astaire were very cool. Writers like Harold Arlen, Cole Porter, all of those guys - I just thought the songs were magical. And then, as I got to be a songwriter I thought it's beautiful, the way they made those songs." Determined to approach the record in a new and unique manner, Paul enlisted the help of LiPuma and Krall and her band-who delivered ultra-high quality musicianship and were completely in tune with Paul's restraint and feel for the music. In the studio, the recording of this album was also a new challenge for Paul who, for the first time ever, performed exclusively in the vocal booth without an instrument - no guitar, no bass, no piano - which led to a vocal performance like no other in his career. He adds, "It was very spontaneous, kind of organic, which then reminded me of the way we'd work with The Beatles. We'd bring a song in, kick it around, when we found a way to do it we'd say 'Okay, let's do a take now' and by the time everyone kind of had an idea of what they were doing, we'd learnt the song. So that's what we did, we did the take live in the studio." "It was important for me to keep away from the more obvious song choices so, many of the classic standards will be unfamiliar to some people. I hope they are in for a pleasant surprise." The album was recorded at the legendary Capitol Studios in Los Angeles, New York and London throughout 2011. It also features guest musicians Eric Clapton and Stevie Wonder, respectively, on the original compositions "My Valentine" and "Only Our Hearts." The deluxe version will include the same tracks below but have expanded artwork and a download card for an exclusive live performance. The vinyl will be 180 gram with a download card as well. I think that's nonsense about being the first time in the vocal booth without an instrument. I've seen plenty of photos of him with the Beatles and on his own at a mike recording the vocals. That's not what is meant. What the article means is that Paul doesn't play any instrument on the album itself. If that's the case, why should it make any difference to the way he sings? Because he has to rely on just his voice making his imprint on the album.